Special thanks to Della and Melvin Shafer at the Sumner County History and Genealogy Center in Wellington for their great help in locating Pope genealogy and documents. The following is based heavily on an excellent genealogy report by Judge William A. Pope, II of Oakton, VA, on Feb. 28, 1997, hereinafter referenced as the Pope Report. That report is on file with the Sumner County Historical and Genealogical Society in Wellington, KS. William Pope, perhaps we should call him William the First, was born in North Carolina in 1776. The 1820 U.S. census shows 8 men with the name, William Pope, living in North Carolina in 6 different counties. His wife’s name is not known. The Pope Report suggests a maiden name of Gilleland. I think that is unlikely because Thomas J. Pope married Martha Gilleland and there is evidence that his daughter, Nancy J. married John O. Gilleland according to a biography of Theodore R. Gilleland in a History of Hendricks County, Indiana, Profiles of Liberty Twshp. Unfortunately, the 1820 census gives only name and location. The Pope Report suggests that “prior to 1830, he left North Carolina, and ultimately settled in Hendricks County, Indiana.” Other records show that two of his sons were born in 1812 and 1816 in North Carolina and one son was born in 1817 in Kentucky. 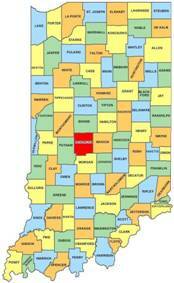 Hendricks County, Indiana, shown in red/black on the map, is just west of Indianapolis. In the Pope Report Notes, “William Pope’s name appears in the Census of 1830, 1840, and 1850 for Hendricks County, Indiana. The 1850 Census shows him as the head of the household, his age as 74, his place of birth as North Carolina, and his occupation as Baptist minister.” William died in 1853 and is buried in the Irons/Miles Cemetery in Hendricks County, Indiana. William Pope [the Second] 1812-? 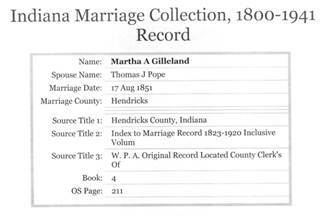 While in Hendricks County Indiana, Thomas J. Pope married twice. 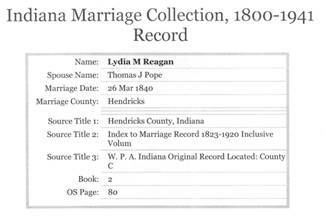 According to the Indiana Marriage Collection 1800-1941 Record, when Thomas was about 24 he married Lydia M. Reagan on 26 Mar 1840 in Hendricks County. Less than 2 months later on 09 May 1840 their first son, Francis [Frank] Marion Pope, was born. A daughter, Mahala Violet Pope, was born in 1845, and another daughter, Mary Helen Pope, was born 6 June 1848. We have no record of what happened to his first wife, Lydia, but on 17 Aug 1851 Thomas married Martha Ann Gilleland in Hendricks County Indiana. She was only about 15 at the time and Thomas was 35. Their firstborn was a daughter, Jane, born in 1855 in Indiana. Subsequent census records show all children living with Thomas and Martha. One possible conclusion is that Lydia died between 1848 and 1851. 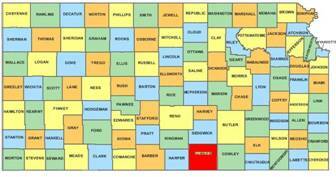 Sometime between 1855 and 1860 Thomas and Martha moved to Gentry County, Missouri [shown in red/dark] with their family. The two counties highlighted are Gentry on the right and Andrew, where Thomas later moved. They are listed in the 1860 census for Gentry County in a listing that spans two pages. His older brother, William, is also listed in the same census, though his age stated in the online index file is inconsistent with the age given on the actual image, which is 48. Copy of the appended census records for Th. Pope is shown here, modified in size to fit the page. 38 Th. Pope 43 M Mechanic 500 N.C.
39 Marion 19 M Ia. 1 Mahala Pope 15 F Ind. An age of 43 for Th. is fairly consistent with his birth of 17 Jan 1816 found in other records. The Pope Report concludes that “Marion” is a son, Francis Marion Pope, born 5 May 1840 making him about 19 in the 1860 census. “Martha” is likely Martha Ann, wife of Thomas. 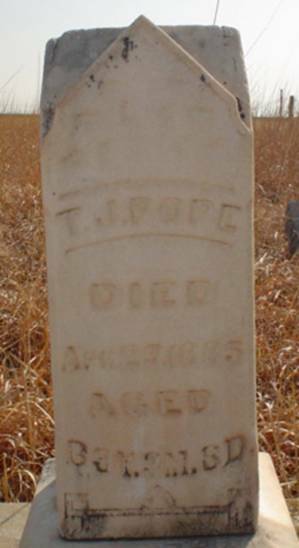 “Mahala” is probably his daughter, Mahala Violet Pope, born about 1845. Mary is most likely his daughter, Mary Helen Pope born 06 Jun 1848. Jane is likely the firstborn daughter of Thomas and Martha. 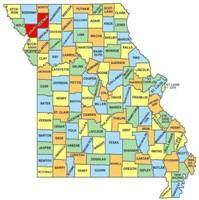 By 1870 the Thomas J. Pope family had moved from Gentry County to the adjacent Andrew County, Missouri and is recorded there in the 1870 census for Jefferson Township. 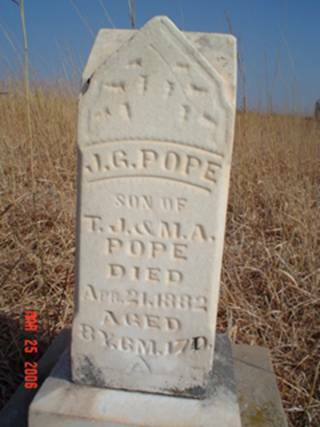 From his tombstone we know that Thomas J. Pope died on 25 Apr 1885 at the age of 69, so it would appear that for the 1870 census he understated his age by a year or two. “Miranda J.” is probably Miranda Jane Pope, a daughter listed as Jane in the 1860 census. There is not further record of Columbus or James and they do not appear with the family or separately in the 1880 Missouri census. Susan Martha Pope was known by the nickname, “Sudie,” all her life according to living family members, including myself. It is believed that “Jeffie” is a nickname for Jefferson. Thomas appears to understate his age by about 4 years, as he died 5 years later at the age of 69. Sometime between 1880 and 1882 Thomas J. moved his family from Missouri to Morris Township in Sumner County, Kansas near his oldest son. Soon after that his youngest son, Jeffie died. My sister, Joann, recalls that family oral history says that he was killed when a horse rolled on him. Jeffie is buried in Morris Center Cemetery in Morris Township, Sumner County, Kansas. T. J. & M. A. 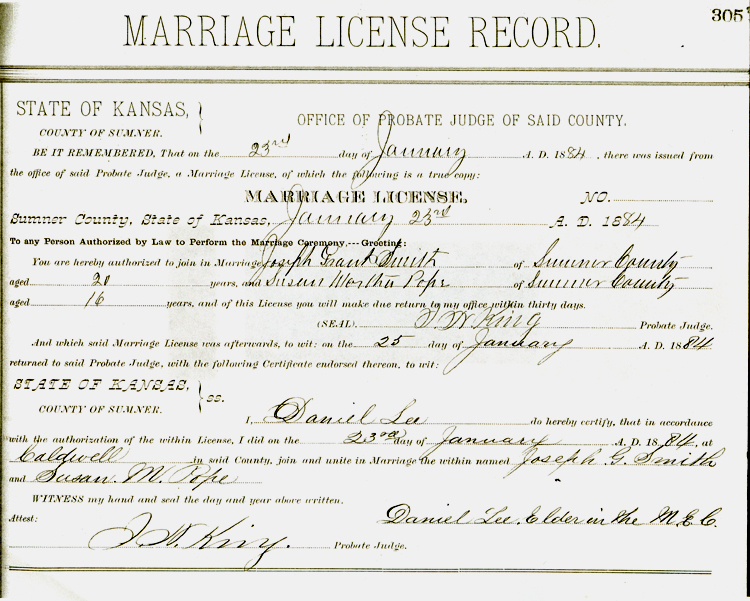 On 23 Jan 1884 Susan Martha Pope, the youngest living offspring of Thomas J. and Martha Ann, was married to Joseph Grant Smith in Wellington, Sumner County, Kansas. On 18 Aug 1884 Thomas J. Pope filed a homestead claim and paid $100 for 80 acres of land in Bluff Township, Sumner County. A copy of the receipt is shown here. The location of the homestead was only about a mile west from that of his son, Theodore G. Pope. 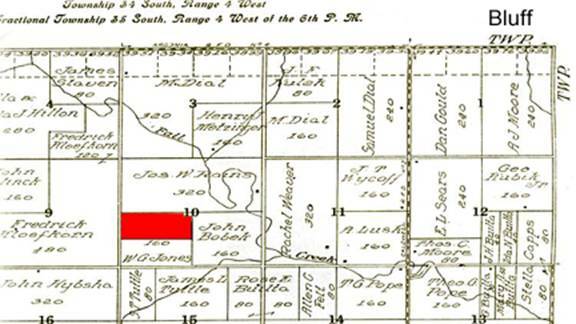 A portion of an ownership map from 1918 is shown here with the 80 acres homesteaded by Thomas J. shown in red/dark. By the time the map was created in 1918 the homestead was part of 160 acres owned by W.G. Jones. 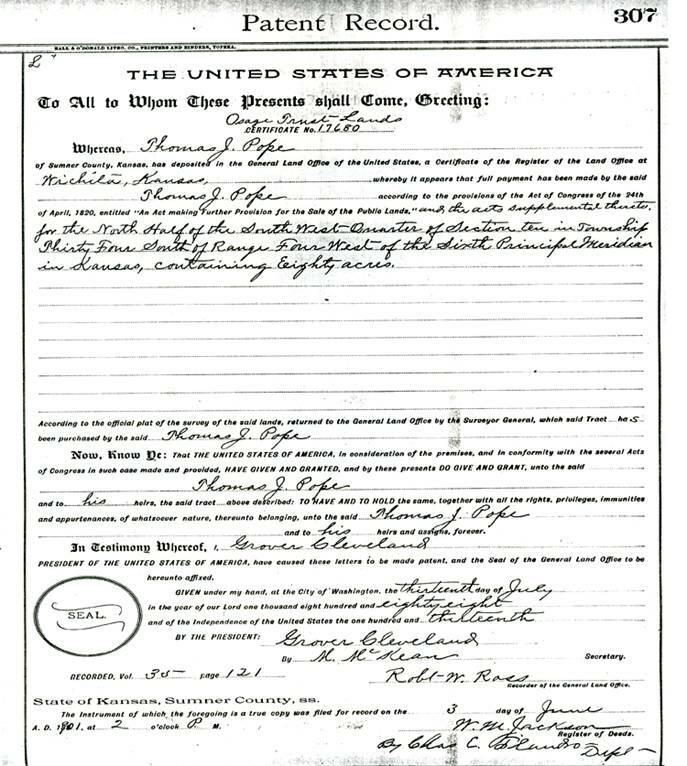 Thomas J. Pope never lived to see his homestead request granted, but it was granted to his heirs on 3 Jun 1901 with a land patent. A copy of that patent is in the Wellington, Kansas courthouse and is reproduced here. He died on 25 Apr 1885 about 3 years after the death of his youngest son, Jeffie. They are buried near each other in Morris Center Cemetery, Morris Township, Sumner County, Kansas. No printed obituary for Thomas J. Pope has yet been found.